In 1908, Leo Buerger reported a rare disease which affected the hands and feet and was named Buerger's disease or thromboangiitis obliterans. This disease is more prevalent in the Middle East and Far East. However, according to the Center for Disease Control and Prevention (CDC) statistics, the incidence of this disease is lower in United States, i.e., 10-20 people per 100,000. The disease is slowly gaining prevalence amongst the youth and is also becoming common amongst women. Read and learn more about the various symptoms of this disease and the ways to treat it. What Are the Symptoms of Buerger's Disease? In this rare disease, there are chronic inflammations in arteries and veins of your limbs, which then swell and get blocked by blood clots. This can cause death of tissues, leading to increased chances of infections and even gangrene. The symptoms of the disease include an intermittent pain in your limbs that arises when you use your hands and feet and lessens when you stop your activity, also known as claudication. You could also notice an inflammation along the veins below the surface of your skin, due to the presence of blood clots. Besides, you may notice a condition called Raynaud's phenomenon, in which there is paleness in your fingers and toes when they are exposed to cold temperatures. Sometimes there are painful open sores on your toes or fingers as well. Although the actual cause of this disease is unknown, some people have shown to have a genetic predisposition to it. Besides, Buerger's disease is characterized by swollen and inflamed blood vessels, which give rise to blood clots. These clots block the blood vessel and cause a restriction in blood flow, where it is unable to circulate in the tissue. The tissues get deprived of oxygen and nutrients and die. This leads to increased pain and weakness in your lower limbs, which then spreads to other parts of your hands and feet. Smoking: People who smoke heavily are more prone to developing Buerger's disease, no matter it's cigar, cigarette, chew tobacco or any other form of tobacco. That is because the chemicals in tobacco could irritate the lining of blood vessels and make them swell. Besides, passive smoking can worsen your preexisting condition. Chromic Gum Conditions: Buerger's disease can be caused by long term infections present in your gums. Although test can't directly detect Buerger's disease, the tests below need to be performed to aid in diagnosing this disease. Initially a plethysmography or an ultrasound of the affected extremities is performed, followed by a Doppler ultrasound. These tests are done to measure the blood flow and detect changes in blood volume to determine whether there are blood clots in the vessels of your limbs. You may also need to undergo blood tests to rule out the possibility of diabetes, scleroderma and atherosclerosis – diseases that can also cause inflammation of blood vessels. You may even need to perform a heart echocardiogram to detect the source of blood clots. In case the diagnosis is still unclear, a blood vessel biopsy needs to be done. 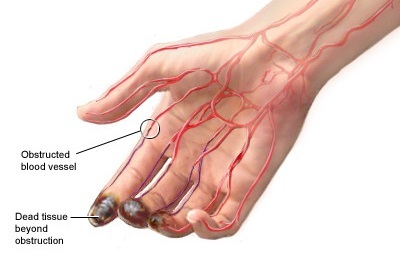 It is a painful disease that can lead to tissue death or amputation of your digits, if left untreated. Follow the treatment options described below to relieve your sufferings. The first step in the treatment is to stop smoking. Continued smoking could make your symptoms persist or could even worsen them leading to progression of the disease. The disease gets inactivated if you quit smoking. Avoid passive smoking too. The infections on your hands and feet need to be treated immediately by antibiotic medicines. Your doctor may prescribe NSAIDS or codeine containing medicines to treat your skin ulcers or infections. Though it is not possible to replace all your blood vessels, certain surgeries that can unblock them are popular. Surgical amputations are required if the disease is worsened by continued smoking. The degree of damage by the disease determines whether the amputation is restricted only to your digits or involves the whole limb. Another procedure called sympathectomy is also performed, in which the nerves are cut off to reduce your pain. Since Buerger's disease gets worse in cold temperatures, you should avoid exposure to cold or wrap yourself to keep warm. Light exercises along with a massage and application of heat will ensure proper blood circulation in your limbs. Avoid walking barefoot and use proper fitting footwear to lessen injuries. You should also avoid wearing tight clothes that restrict your movements. Do not sit and stand in the same position for long periods of time.